6 points are located on a circle and lines are drawn connecting these points, each pair of points connected by a single line. 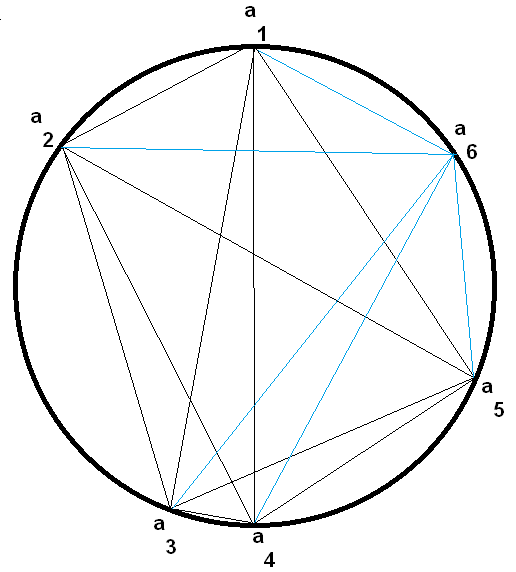 What can be the maximum number of regions into which the circle is divided? My answer is 32 . But the actual answer is 31 how ?? This can be proved using induction (other combinatorial proofs exist too). For more information (including at least two proofs), see this: Dividing a circle into areas. This is an oft cited puzzle to show the perils of generalizing based on first few values. We get powers of $2$ till $n=5$, after which we get $31$. The more general case is stated far more elegantly here: Number or regions formed when $n$ points on a circle are joined. But sometimes having a concrete example helps, and I hope this does. We'll assume there are no 3-way intersections for the moment. However, it seems like 2 points divide the circle into 2 areas, 3 into 4, 4 into 8, 5 into 16, and so the pattern keeps working. Here is what happens for $n=6$: Let's draw a circle with points $a_1$, $a_2$, $a_3$, $a_4$ and $a_5$. Now put $a_6$, without loss of generality, between $a_1$ and $a_5$. $a_1a_6$ and $a_5a_6$ each add one section to the circle, no more. That's 2.
we'll also ignore any intersections with other segments inside the circle for the moment and note $a_2a_6$/$a_3a_6$/$a_4a_6$ also create at least one more section. That's 3. $a_3a_6$ runs across a few lines, but which? $a_1$ and $a_2$ are on one side of it, but $a_4$ and $a_5$ are on the other. Therefore ($a_1$ or $a_2$) to ($a_4$ or $a_5$) may cross $a_3a_6$ inside the circle, but no others. That's 4. $a_2a_6$ runs across a few lines too: $a_1$ and $a_3$/$a_4$/$a_5$ are on each side. Therefore $a_1a_3$, $a_1a_4$, and $a_1a_5$ all may intersect with $a_2a_6$ to create another region. That's 3. $a_4a_6$ is similar to $a_2a_6$. $a_4a_6$ will intersect $a_1a_5$, $a_2a_5$, and $a_3a_5$. That's 3. Thus the maximum number of additional regions moving from $n=5$ points to $n=6$ points is 2+3+4+3+3, or 15. I included a diagram below to show what lines are added with a 6th point. I hope it helps you see things. intersection of lines and planes ? Analogue of Moser's circle problem to higher dimensions? What is the maximum number of non-overlapping interior regions? How to prove the maximum number of chords those can not across more than one other chord from points around the circle?